Looking for a Job Search App for your mobile device? 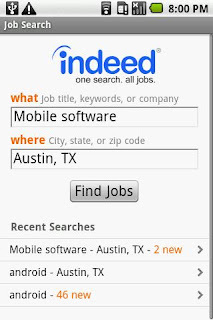 Here you can get one developed by Indeed.com, the most comprehensive search engine for jobs. With this Job Search application, you can access millions of jobs from thousands of websites. You can find your favorite jobs from your phone with this highly comprehensive search engine.